In form of dark blue color book on thick paper. The size of certificate is ≈ 9 cm x 13,3 cm, with the watermark in form of CCCP (USSR) inscription. On the front page is the Coat of arms of the RSFSR (Russian Soviet Federative Socialist Republic), all inscriptions are made in Russian and Finnish languages. The certificate contains information about newlyweds, including names before and after marriage, birthplaces, the date of the marriage and the location of the marriage registration. All inscriptions on the certificate form are made in Russian and Finnish languages. On the back side are specified: National language, Goznak (State Insignia) and the year of issue. In form of dark blue color book on thick paper. The size of certificate is ≈ 9 cm x 13,3 cm, with the watermark in form of CCCP (USSR) inscription. On the front page is the Coat of arms of the ESSR (Estonian Soviet Socialist Republic), all inscriptions are made in Russian and Estonian languages. The certificate contains information about newlyweds, including names before and after marriage, birthplaces, the date of the marriage and the location of the marriage registration. 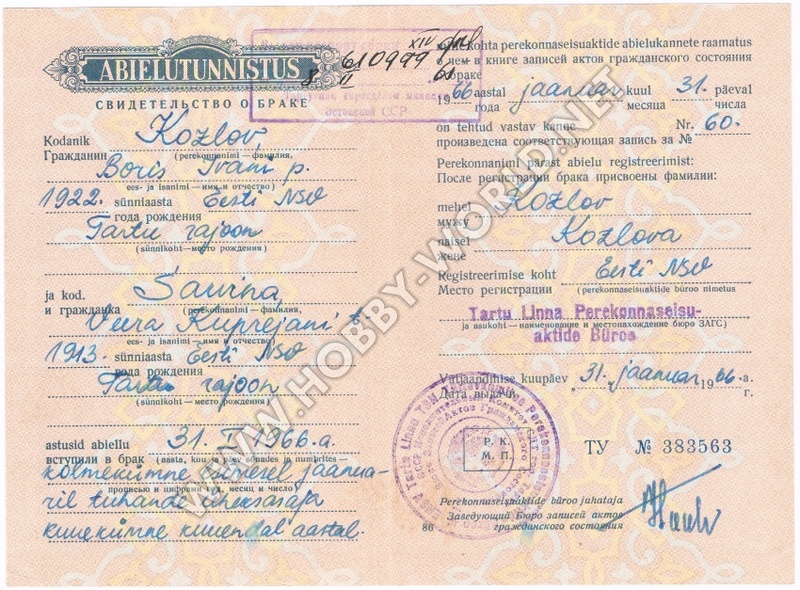 All inscriptions on the certificate form are made in Russian and Estonian languages. On the back side are specified: Goznak (State Insignia) and the year of issue. In form of dark blue color book on thick paper. The size of certificate is ≈ 9 cm x 13,3 cm, with the watermark in form of CCCP (USSR) inscription. On the front page is the Coat of arms of the ESSR (Estonian Soviet Socialist Republic), all inscriptions are made in Russian and Estonian languages. The certificate contains information about newlyweds, including names before and after marriage, birthplaces, the date of the marriage and the location of the marriage registration. All inscriptions on the certificate form are made in Russian and Estonian languages. On the back side are specified: National language, Goznak (State Insignia) and the year of issue. In form of dark blue color book on thick paper. 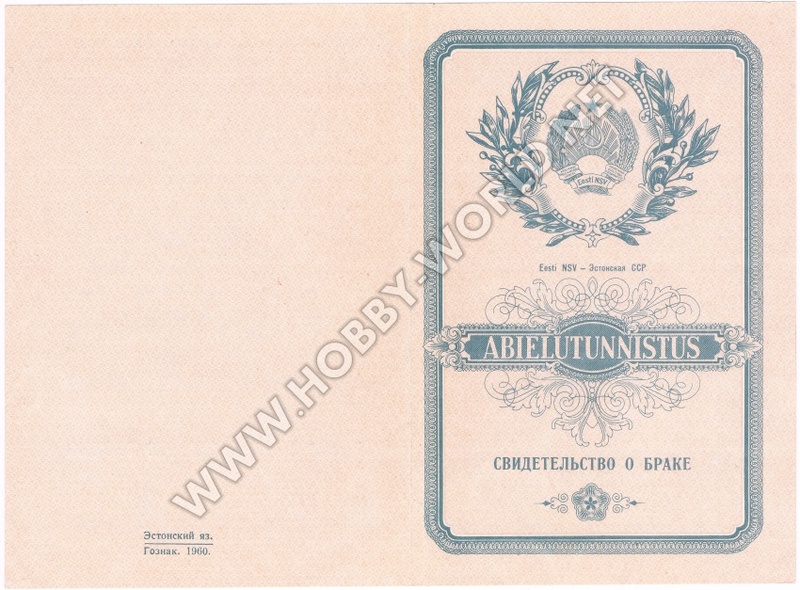 The size of certificate is ≈ 9 cm x 13,3 cm, with the watermark in form of CCCP (USSR) inscription. On the front page is the Coat of arms of the RSFSR (Russian Soviet Federative Socialist Republic), all inscriptions are made in Russian and Adyghe languages. The certificate contains information about newlyweds, including names before and after marriage, birthplaces, the date of the marriage and the location of the marriage registration. All inscriptions on the certificate form are made in Russian and Adyghe languages. On the back side are specified: National language, Goznak (State Insignia) and the year of issue. In form of dark blue color book on thick paper. The size of certificate is ≈ 9 cm x 13,3 cm, with the watermark in form of CCCP (USSR) inscription. On the front page is the Coat of arms of the Georgian SSR (Georgian Soviet Socialist Republic), all inscriptions are made in Russian and Georgian languages. The certificate contains information about newlyweds, including names before and after marriage, birthplaces, the date of the marriage and the location of the marriage registration. All inscriptions on the certificate form are made in Russian and Georgian languages. On the back side are specified: National language, Goznak (State Insignia) and the year of issue. In form of dark blue color book on thick paper. The size of certificate is ≈ 9 cm x 13,3 cm, with the watermark in form of CCCP (USSR) inscription. On the front page is the Coat of arms of the RSFSR (Russian Soviet Federative Socialist Republic), all inscriptions are made in Russian and Tatar (Kazan) languages. The certificate contains information about newlyweds, including names before and after marriage, birthplaces, the date of the marriage and the location of the marriage registration. All inscriptions on the certificate form are made in Russian and Tatar (Kazan) languages. On the back side are specified: National language, Goznak (State Insignia) and the year of issue.